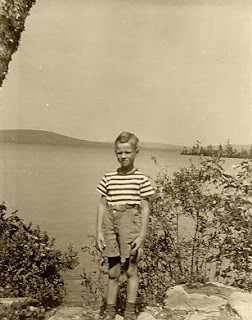 Northdixie Designs: Going to "Camp"
Granddad's Old Camp - back in the 40's or 50's? "Camp" is a lake called Cold Stream Pond. My grandfather bought land there back in the 30's or early 40's. 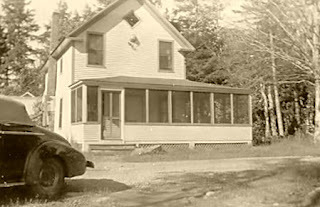 On the land was an old hunting lodge called Rustic Lodge, pictured above. Rustic Lodge was built with some features typical of Adirondack style. An old tree was used as the banister to the upstairs, with the branches of the tree intertwined. Over the years children broke the branches off. On the walls are coathooks made from the Y's of branches, split and nailed to the wall. The walls are old wood paneling, done on the horizontal. It basically is one big room downstairs with a kitchen in the back and two bedrooms upstairs. And in the front is a nice big deep screened porch where you can sit at night and not be bothered too much by mosquitoes. 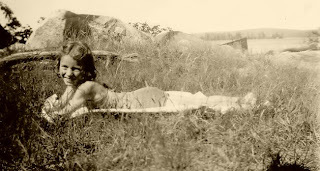 As a girl, when all the cousins were there, we practically carpeted the place with sleeping bags at night. Who knows how many times that lake has embraced my family? 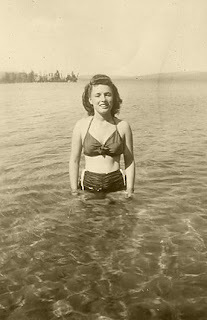 This is another aunt as a teenager. What a beautiful girl! Here's an aerial view of Cold Stream Pond. Cold Stream Pond is a clear, spring-fed lake that is COLD. ;-) It's bigger than a pond - it's a lake with two bodies connected by a very narrow channel - there is Upper Cold Stream and Lower Cold Stream. In a week we are having an extended family reunion. so now we are dotted all along the shore line. It's a wonderful, beautiful thing. Wow. How special to have a family camp. Great old memories and new memories to create for the future. Have a wonderful time!